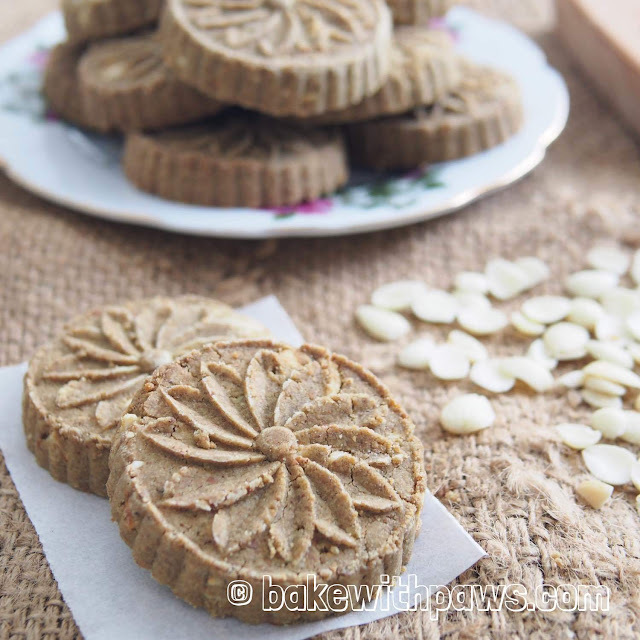 I just got this beautiful wooden Chinese cookies mould recently and couldn’t wait to try it out so I made almond cookies again. But, this time I used Chinese sweet almonds (a.k.a apricot kernel) instead of American almond. I just learnt that Chinese almonds are actually apricot kernels and it is not American almond nuts. Due to a mistaken historical translation, all Chinese apricot kernels are called Chinese almonds. 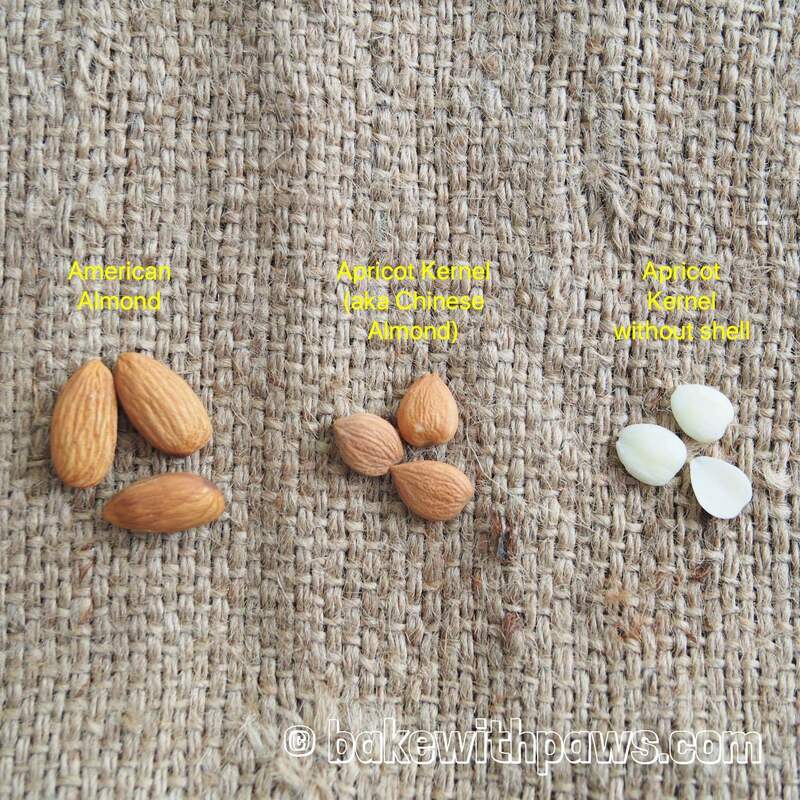 There are two type of Chinese apricot kernels. There is the Southern apricot kernel that are sweet and Northern apricot kernels that are bitter and usually used as a traditional Chinese remedy to treat colds and coughs. Southern apricot kernel is used more as a food. We used southern apricot kernels in this recipe. 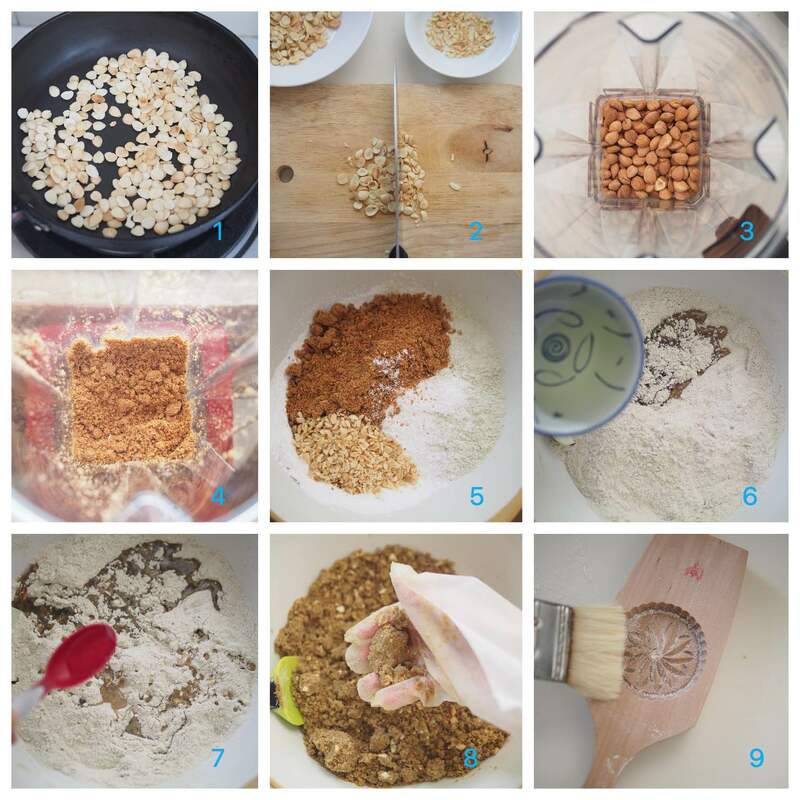 This recipe is adapted from Traditional Chinese Pastries Book by Amy Wong with slight modifications. It is slightly different from the Macau Almond Cookies I shared previously. Preheat the oven to 165C (top and bottom heat). In a big mixing bowl, combine mung bean flour, ground almond, icing sugar and salt together. Then add in the chopped Chinese sweet almond and mix well. Add vegetable oil and water. Please do not add all at one time. Use your fingertips to rub the mixture until it resemble bread crumbs. Slightly dust the cookie mound with plain flour. 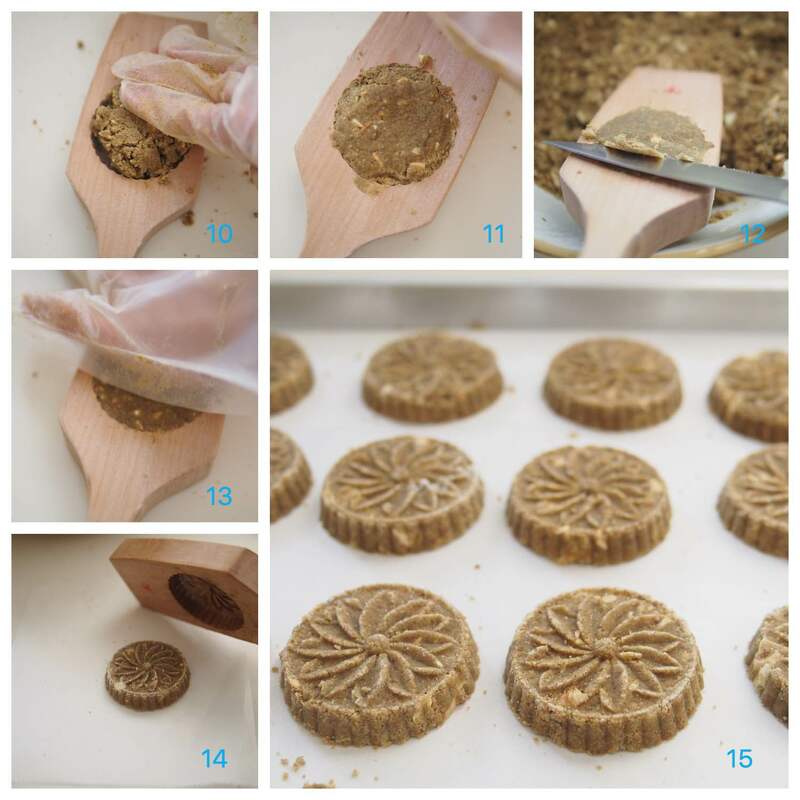 Fill the mixture into the cookie mould and flatten with your hand. Scrap off the excess mixture with a scrapper or knife. Press with hand again to make it compact. Knock out the cookies onto a table top or on a parchment paper and transfer the lined baking tray. Bake at preheated oven for 20 to 25 minutes. Let the cookies cool on the wire rack completely before transferring to an airtight container. 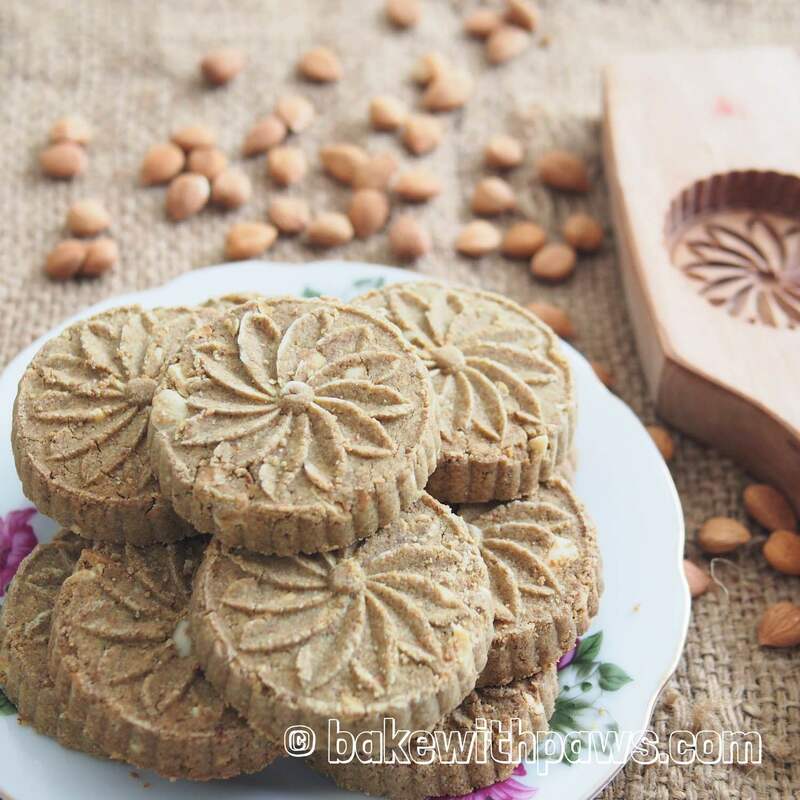 If you are unable to get ground Chinese almond or almond powder, toasted 150g of whole Chinese almond slightly and blend in a powerful food processor until fine. The temperature and time duration are just as a guide. Please adjust accordingly to your oven. Some oven are hotter than others. I use Electrolux built in oven. These cookies are a darker green due to the use of green bean flour in the recipe. 2019 Chinese New Year is coming. 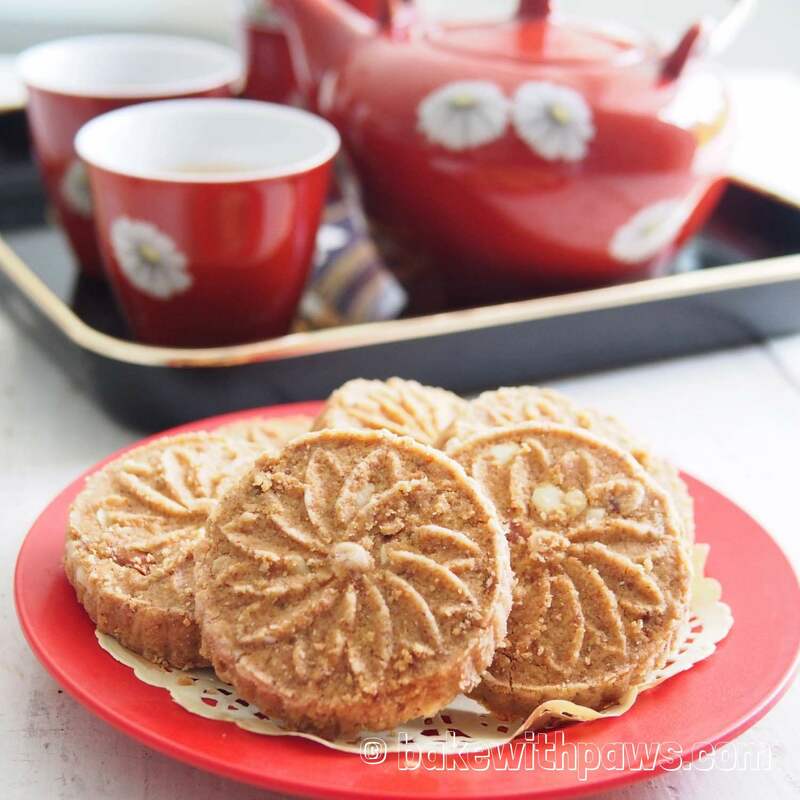 I made another batch of Chinese Almond Cookies using the same recipe as above. 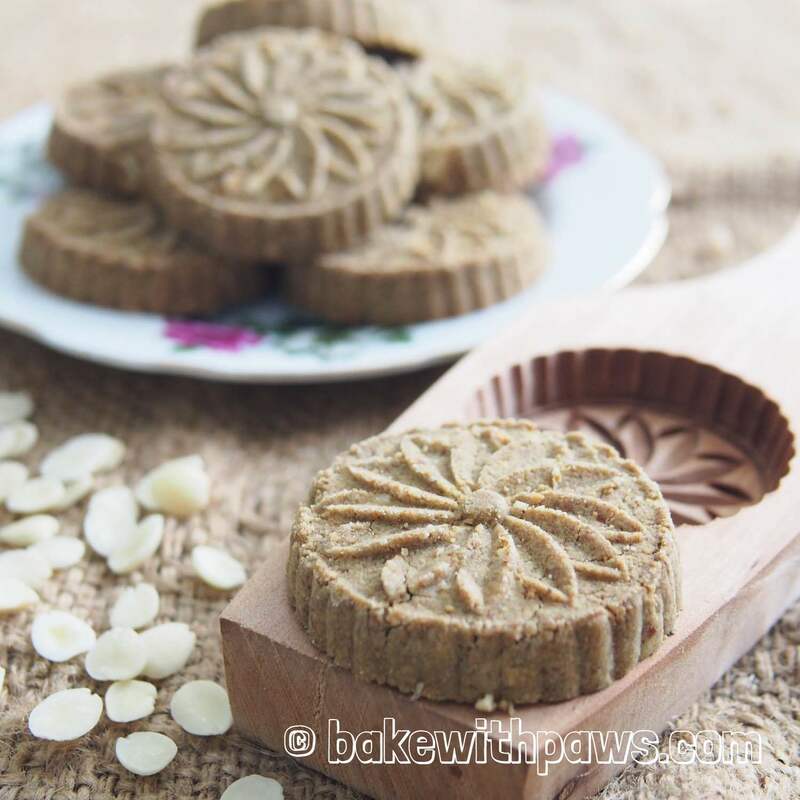 But, this time I used Homemade Yellow Mung Bean Flour instead (Please click here for recipe). The colour turned out lighter and nicer to me.